Last night I was talking to Grayson about Jake's upcoming birthday (I KNOW! HE'S ALMOST 2!) and the fact that I needed to order his cake. Me: "I need to e-mail Vickie and tell her what kind of cake to make." Grayson: "What kind of cake IS she going to make?" Me: "I was thinking Elmo, or maybe Mickey Mouse." Me: "JAKE! Do you want a Buzz Lightyear cake?" Me: "Okay, buddy, you can certainly have a Buzz cake!" Me: "I wonder if she's ever made a Buzz cake before." 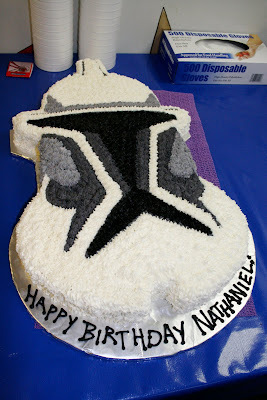 Nathaniel: "Why don't we just get the Ace of Cakes to make it?" Me: "Because he charges like $500 for a cake." Nathaniel: "Well, you HAVE a credit card." Me: "We're sticking with Vickie." Vickie, a local gal who bakes cakes in her home and delivers them to us, is amazing. I find her even more amazing now that I've actually checked the Charm City Cakes Web site and saw that they actually have a $1,000 minimum on any cake they make. Vickie's cakes start at about $35 and serve 25 people at that price. And, I might add, they are DELICIOUS. I can't wait to see what she comes up with for Buzz, because I didn't give her any direction on the other two cakes ... I just told her I wanted a Lego cake and a Star Wars cake. That was it. I love someone you can give that little information and she can come up with the beautiful creations she made for us. Anyway, we will continue to stimulate Vickie's personal economy, but we'll leave the thousand-dollar cakes for other people. WOW. I'm still absorbing that little piece of information. I cannot fathom $1k for a cake. People who pay that do realize that it's just cake, right? I'm sure your Buzz Cake will be great because those other cakes look fabulous! That's hilarious. I like that he's speaking up for himself with the cake issues in his life. Sheesh! That's wedding cake prices. Can't wait to see the Buh cake. I'm sure it will be amazing like the other two. These cakes look like a lot of fun! I may just have to give the lego one a try for boy #4 birthday coming up soon! I KNOW, everyone! I couldn't believe the prices, especially because that's the MINIMUM. I bet there are precious few cakes that actually cost $1,000 ... the majority are surely well beyond that because they're all custom-made and some of them are GIGANTIC. SET, it cracked me up that he spoke up and answered for himself. I was floored but shouldn't have been. Crisanne, feel free to print that picture for yourself or your baker if you'd like to use it as an inspiration for your LEGO cake! The Lego cake is so cool!! I'd stick with your local girl. :) Thanks for the visit! At the moment, our birthday theme is Toy Story, also. We're taking it on from the Jessie the Cowgirl angle - Miss M's favorite Toy Story character (though I guess it's Toy Story 2? I don't pay *that* much attention). I spent much of this morning dreaming about party favors - it's a perfect theme for boy or girl favors, so I'm thrilled!